What are some things you have been neglecting in your life that are spiritually, physically, or mentally beneficial? It is likely that these are going to be hard things to make good habits of. Why? Because you’ve been conditioned to a lifestyle of convenience and instant gratification rather than the hard work and waiting to develop more beneficial things in your life. The late preacher A.W. Tozer once said, “we are called to an everlasting preoccupation with God”. Yet how many have answered that call? If we were honest we would have to admit that we are not preoccupied with Christ but preoccupied with the things of the world. A preoccupation with Christ doesn’t come about by accident. It is not as if you are wandering around in the dark one night and you accidentally stumble into a pit called “a preoccupation with Christ”. It’s just the opposite. It is like trying to climb Mt. Everest. There are some obsessed people who climb or want to climb Mt. Everest. It’s not something that happens overnight. It takes a lot of time and preparation and a large amount of money on top of it. One of the biggest obstacles though is the limitations of the body. The climbers have to spend a couple weeks at base camp to allow their bodies to climatize to the high altitude and the low oxygen levels. 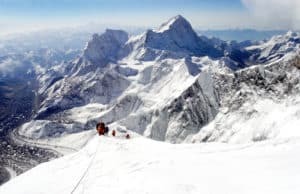 The local Sherpas who were born and raised in that region have unique physical qualities that allow them to be better suited to the climate and altitude. Their heart and lungs are adapted to give their bodies more oxygen than the average foreigner can gain without bottled oxygen. Likewise, if you want to grow in passion for Jesus and live a life that’s different than what you are living now, it will take time to “climatize” to a new surrounding. Here are four ideas that can help you acclimate to new heights of spiritual living. Keep a journal during your media fast and when you’re done take some time and write a short article about what God taught you during that time or share your insights in a two minute video and send it to me and I’ll post it on our site! 3. Renew Your Mind and build a stronger Biblical worldview in your life by spending more time in the Bible. Take our Bible reading challenge and read the entire Bible in 101 days – you can do it! It only takes about 45 minutes a day. The average reader can read the Bible in about 70-75 hours. I took this challenge myself earlier this year and it took me 44 minutes a day on average to read the entire Bible in 101 days. Some people make the argument that they don’t like to rush through reading the Bible or they don’t want to be “legalistic” about a Bible reading plan. I don’t believe it is legalistic to discipline yourself to read the Bible on a regular basis, because legalism is not about a disciplined life but about a wrong philosophy that you can somehow earn your salvation through doing things. Let’s get past that excuse and address the other issue of not rushing through the Bible. Reading the Bible 45 minutes a day could hardly be considered “rushing” through the Bible. While I was reading the Bible in 101 days that did not stop me from diligent study beside my Bible reading or keep me from meditating on certain verses and memorizing others.Try this – read the Bible in 101 days (a little over three months) and spend the other 8 months of the year reading the Bible slower. The benefit I gained from reading so much Scripture in a shorter time is that it saturated my thoughts with God’s Word and I was able to get a birds eye view of the entire story that God has written for us.